This is a small, softcover booklet with a big message. The Story of Jesus uses the clear, accessible language of the New International Version to tell, in just 96 pages, the story of the most significant human being who ever lived. 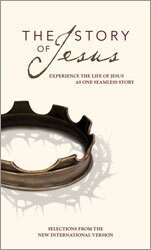 Compelling and powerful, it’s also a compact, low-priced way to share the Jesus story in one seamless narrative. Whether it’s a gift, the basis for a small group, or just a keepsake you want for yourself, The Story of Jesus is one book that will be read again and again. This booklet includes Scripture selections from the NIV and transitions in between Scripture selections, as taken from The Story, NIV. Also includes discussion questions.